Being able to transmit the artistic content of the musical event as much as possible, trying to keep the original spirit of who interpreted this event, in order to deliver all the cultural flavours and artistic energy. An ambitious target, summarized at Opera Audio by an effective and straightforward slogan: "Simple, Human". To achieve this target they create products ranging from digital sources to amplification, both tube based and solid state, as well as electrostatic transducers. This time we will review a tube amplifier from the Reference series, the Consonance 6.6, a 25W per channel unit using KT66 tubes. 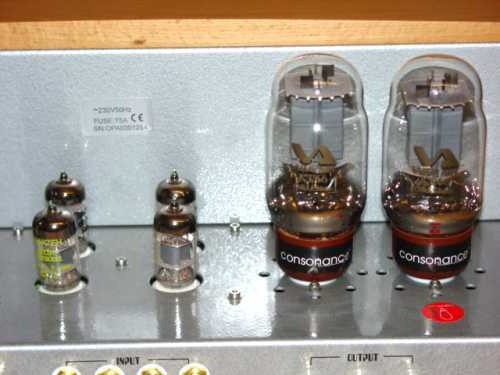 Belonging to the same product range, showing pretty similar constructive and aesthetic features, there are the Reference 5.0, a 9W per channel with a pair of 300B tubes, the Reference 5.5, which instead uses 4 300B (2 in parallel per each channel) delivering twice the power (18W), and the most powerful of the range, the Reference 8.8, a push-pull with 4 6550 and 50W output power. 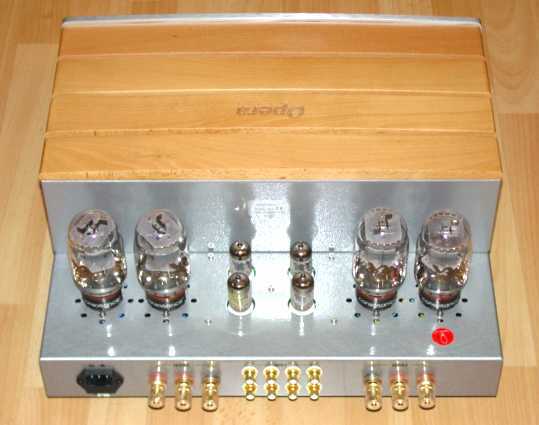 Opera Audio have thought to design an integrated amplifier around a product they regarded as particularly good from the musical point of view, the GEC KT66 replica tubes manufactured in China by Guiguang of Guangxi, implementing around them a push-pull circuitry. The driver stage uses a pair of Sovtek 12AX7LPS and a pair of 60s NEC 12AU7 NOS. The power supply is delivered by a toroidal transformer while the output transformers are the same ones used for the most prestigious range of the brand (Signature). Output Impedance 4-8 ohms. Selectable. The aesthetics of the amplifier are in this case quite subjective. I found it a bit bulky, but still quite charming given its vaguely 'retro' look, like a big old-timer tuner, with a magic eye (a small 6E2) placed at the center of the thick aluminum front panel and two big control knobs at its sides (the pictures are self-explaining). I find it strange that tubes are always put under the spotlight nowadays, even when it is not needed. This amp has the tubes placed on the rear panel, in fact hidden (but also protected from "indiscrete" hands). The cherry-wood top panel is quite unusual. 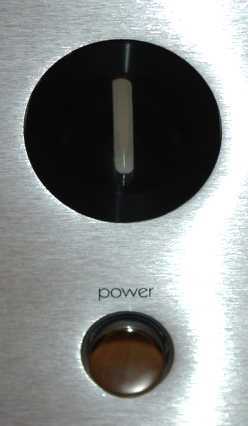 The unit is extremely easy to use: the bias has been optimized, therefore no intervention is needed, the CE-compliant binding posts are robust (like the rest of the amplifier) and of a good size, and all the controls are on the front panel, including the power switch. The Consonance Reference 6.6 is an outstanding example of how the compromise between different well-blended elements, can lead to a remarkably pleasant global result. The available power, even if it is far from ensuring a live concert acoustic pressure, with its 25w per channel is enough for medium sized listening rooms, as long as it is matched to loudspeaker with a good efficiency (let's say 90 dB and up...). The timbre fingerprint is such that does not require particular or limiting choices. The sound expressed by the 6.6 is a good match between accuracy of reproduction and softness, substantially sweet and also refined in the high range, more present in the medium-high but without excesses, quite full-bodied but still lively in the medium range, full and discretely articulated in the medium-low and low range. In the lowest range it does what it can, but objectively one cannot expect more than that in terms of extension, energy and handling from this kind of amplifier which, especially if played at loud levels, loses something in terms of articulation and homogeneity. Both the speed and the sense of rhythm make a positive impression which, adequately supported by valid dynamic behaviour for the class of products like the Opera Audio integrated, make listening alive and involving. However, pay attention not to exceed the listening volume, otherwise the Consonance Reference 6.6, which reaches its limits with a certain discretion, will tend to harden and become less coherent, altering the otherwise pleasant timbre characteristics which it has under normal conditions. Micro-dynamics are expressed with grace, but in a very clear and precise way. One more quality of the 6.6 is its good attitude for well-developed holographic dimensions. In particular, I was pleasantly surprised by the height, but neither the depth nor lateral dimensions showed any noticeable limitations either. This holography even if it does not show extremely marked chiaroscuro, features a good overall level of air, leading to a pleasant interpretative breath. The elements, whose boundaries are smoothly faded, do not seem to be separated by an especially pronounced infra-instrumental black, however they are stable and focused, increasing the comprehension of the architectural prospect of the performance. The introspection is in fact quite good, especially in the middle and high range, allowing appreciation of the expressive flavours of voices and instruments. From the manufacturing point of view, this equipment does not allow any relevant criticism, since it is quite solid. The only debatable point is the choice to hide the tubes that probably, for tube fans are an additional aesthetic value not to be neglected. In any case, the choice of not providing a protection cage for the tubes with the amplifier can be criticized. Personally, I did not establish a great feeling with the volume and input select control knobs. From the musical point of view, even when using this product within its energy boundaries, I would have preferred a more extended, solid and articulated bass. A kind of sound that however, most of the times, clashes with the philosophy and circuitry of this kind of amplification. 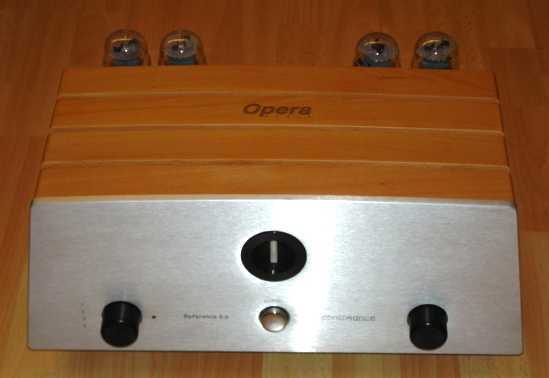 The Opera Audio Consonance Reference 6.6 is a very interesting integrated amplifier. From the musical formulation point of view, it is a good compromise between softness and precision, therefore it is not particularly difficult to match to other equipment. During the test, apart from a really unfortunate match with quite unconventionally designed (and very demanding) horn speakers, in all other cases it behaved outstandingly with most of the good efficiency speakers I tried to connect. Among the Opera Audio integrated amplifiers belonging to the Reference series, as far as I had a chance to listen, the Consonance 6.6 is probably the most equilibrated product, both in terms of delivered power and in terms of sound. For the interesting features shown during this test, without any doubts it deserves a listening from those audiophiles interested in this kind of amplifier.